WEST HARTFORD — – The slaying of a guard inside the U.S. Holocaust Memorial Museum by an elderly anti-Semite and Holocaust denier is stark evidence that the hatred that fuels genocide still exists, a University of Hartford professor who worked at the Washington, D.C., museum from 2004 to 2007 said Thursday. “The museum is very threatening to deniers. It is not just a memorial but a museum that makes a statement to nearly 2 million visitors a year, educating people about the cancer of genocide,” said Avinoam Patt, who teaches American and European Jewish history. Patt said guard Stephen Tyrone Johns was one of many members of the security staff he met while working as a historian and archivist at the museum. Guards were always vigilant, and staff and visitors always screened, he said. But shooting suspect James W. von Brunn, 88, entered the lobby Wednesday with a rifle in plain sight and began firing, an attack that investigators say was likely the action of a “lone wolf.” Von Brunn, a Holocaust denier who served time in federal prison for a 1981 attempted armed kidnapping at the Federal Reserve, was shot by other guards and is in critical condition in a Washington hospital. He has been charged with murder. Patt said the museum is a powerful symbol, with its prominent spot on the National Mall and role as a educational defense against those who would deny the Holocaust and embrace race and ethnic hatred. The attack underscores the need for the museum and society never to forget the horror of the Holocaust and the need to fight genocide anywhere in the world, said Patt, the Texas-born son of Israeli parents both of whose relatives were killed by the Nazis during World War II. In a release Wednesday, leaders of the Jewish Federation of Greater Hartford extended condolences and prayers to Johns’ family and to those visiting the museum when the shooting occurred. “Today’s horrific shooting is a painful reminder that no place, not even a memorial to the Shoah and a revered educational institution, which fights bias and teaches respect, is a haven from violence and hatred,” Dane Kostin, federation president, and Cathrine Fischer Schwartz, federation executive director, said in a joint statement. Patt learned of the shooting while in his university office Wednesday afternoon. He said he knew Johns as a “big teddy bear of a guy” who took his job seriously. “The guards stopped the attack. Just imagine what could have happened if they hadn’t been vigilant,” Patt said. Forty-five years ago, Alyssa Stanton was born into an African-American, Pentecostal family in Cleveland. 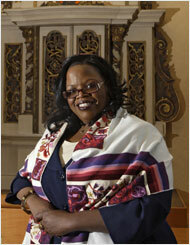 On Saturday, Ms. Stanton is to become a rabbi — the first African-American woman to be ordained as a rabbi by a mainstream Jewish seminary, said Jonathan D. Sarna, professor of American Jewish history at Brandeis University. Alyssa Stanton, once a Pentecostal, plays down her new role as the first African-American woman to be ordained as a rabbi.